A problem I’ve hit a few times during troubleshooting is transferring containers from one environment to another. Importing a whole 100GB database to be able to access the results of a report packed into a 20MB container seems like a bit of an overkill. So, a natural idea would be to save the container to a file and then export. It turns out it’s not that easy, as I couldn’t find any built-in method for serialising a container to TXT or XML and saving to a file. As such, I’ve done what any developer eager to get his/her hands dirty would do and started writing my own code. 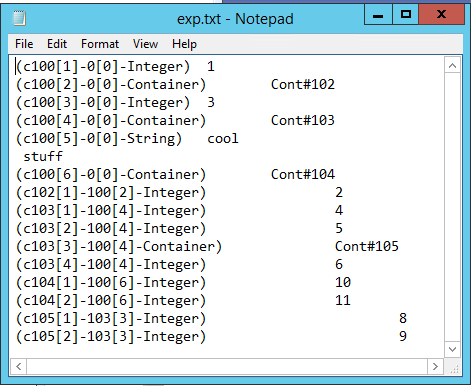 In the exported file, each container contains either values or container references (e.g. “Cont#104”). Obviously, another hard part is to de-serialise the file into a container, as all container references need to be resolved. This is in no way a complete solution but can be seen as a starting point for future development. Some types may not de-serialise well and some new-line characters in strings may not be preserved fully. But future bug fixing should be straightforward with the core mechanism in place. If you find any issues or have fix ideas, please do use the Comment section.